This post is for all of you who have come and gone, those of you still here and especially for those of you thinking of coming back! Today I want to talk about a restaurant near where I live that holds a special place in not only my heart, but all the great people who have come and gone over the years. If you're one of the lucky people who have spent a year or more here in Taiwan and have had the chance of visiting this place, I hope some of these shots I'm sharing will bring back some great memories and a bit of nostalgia about your life in Taiwan. For the rest of you, I'm about to introduce a legendary restaurant here in Zhongli - one that is held in extremely high esteem by both Taiwanese and foreigner alike! Papa’s Secret Lover (阿爸的情人) or "Ah Ba" is a Hakka-style restaurant in Zhongli (中壢) near the traditional market in the old part of town. The restaurant looks like it has been open for decades, it is actually hard to tell how long it has been open, but for as long as anyone can remember, Papa's has been a constant fixture of life here. Papa's can be busy at times, but if you are one of the many who have made Papa's part of your going-away celebrations before leaving Taiwan, you probably don't have to make reservations and they will gladly take care of the forty of fifty people you have showing up - even though there might not be seats for everyone. 國父您好～ Sun Yet Sen must be hungry watching everyone eat. The décor of the restaurant is best described as a 'blast from the past' and whenever someone new walks into the restaurant they likely feel as if they just walked out of a time machine! Every thing you see on the walls has historical relevance and are probably all from the early to middle 1900s. There is no real order to the way things are displayed and a lot of the picture frames seem to be crooked or falling off the wall. There are portraits of both Sun Yat Sen (孫中山) and Chiang Kai Shek (蔣介石) on walls opposing each other and they seem to be staring each other down. Having these portraits there is quite telling of the history that the Taiwanese people have endured over the last 60 years. Apart from portraits of political figures, the walls are full of wedding photos - of who know one really knows - and old movie posters and advertisements. There are posters of long-forgotten celebrities from 1960s-1970s Taiwanese pop-culture. My favourite piece on the wall is the old painted cigarette advertisements with the modern-looking ladies in Qipao's - something straight out of Shanghai in the 1920s. The tables and stools always kind of feel like they're going to fall apart, but truthfully the only time I've ever seen a broken chair in that places is one of the newer plastic stools the boss bought. The wooden tables and chairs have obviously been loyal soldiers to the owners of the restaurant and they are probably all older than I am! The music playing in the restaurant has been exactly the same for as long as I've been in Taiwan and without fail every time you visit, you will hear the same songs over and over again. I actually have no idea how they haven't worn out the CD or whatever it is they use to play it. The music is likely a compilation of Taiwanese-language oldies and despite not understanding any of the words, most foreigners who have been going to the restaurant can sing the lyrics by heart after they've had a few Taiwan beers. The atmosphere, although extremely cool in the restaurant isn't what keeps people coming back though. The food is the main reason why everyone returns time and time again. To give an example of how awesome the food is, I've heard stories several times of people showing up to Papa's a few hours before a flight and getting some food to go in a dish for a friend back home who used to live in Taiwan. Even if the food is cold and transported across continents, it is still amazing. You're not likely to find Hakka cuisine as good as what you'll find at Papa's and the dishes are so consistent that they taste exactly the same today as they did when I first showed up ten years ago. They don't mess with perfection. 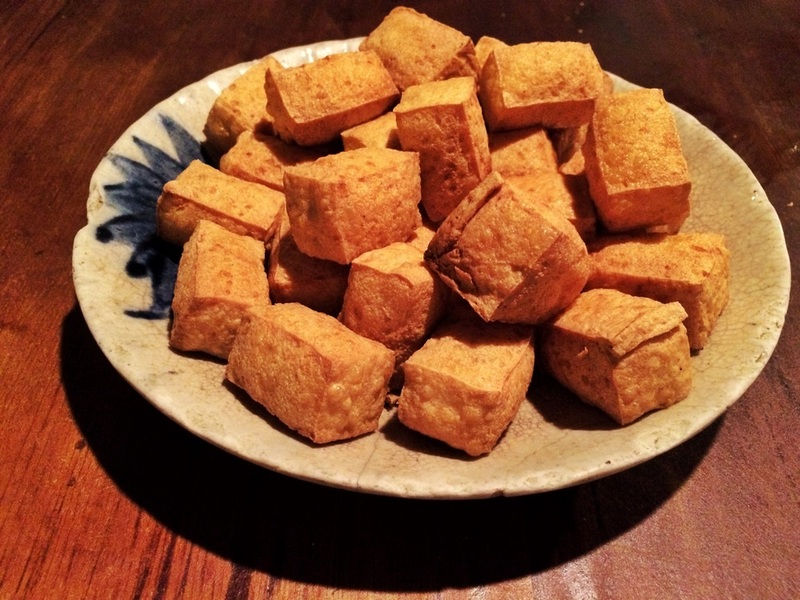 Everyone has their favourite dish but as far as I'm concerned, after travelling all over Asia, I can easily say that I've never had fried tofu as awesome as what you get at Papa's and it is on the table in front of me each and every time I visit. Other people may not agree, but the great thing about Papa's is that there aren't any dishes that aren't awesome, so when you go with friends people will always share their favourites. I've introduced quite a few Taiwanese friends to the restaurant and it is always a bit hilarious to see their reaction as I take them through the front door. Most of them want to turn away thinking that it is the entrance to someones home or that it is too old and dirty to actually be a restaurant. On anyone's first visit to the restaurant they usually sit there with wide eyes in awe of the whole experience – When the food comes out however, they immediately fall in love. The food is always described to me as 「古早味」which is best described as old-style home cooking with flavours that are not as common today as they used to be. Foreigners don't really appreciate the old-style flavours as much as Taiwanese people do, but what we can appreciate is that the food is amazing and the restaurant has been the site of a lot of great times and good memories over the years. If you haven't tried Papa’s Secret Lover yet, make sure to get yourself over here to Taoyuan to have some great food in one of the strangest restaurants you'll ever experience! If you're back home in North America looking at these photos, I hope they bring back some fond memories of your time in Taiwan! 2F #401 Zhongshan Rd. Zhongli City.